I am entering a contest over at Fuelmyblog.com to win a digital camera. So the rules state it is an interpretation to the theme "Through the Window" and I must post the photo on my blog. Without further ado, here it is. A while back I was sitting at my dining room table watching the snow fall, it does not snow here often. I noticed movement and saw a squirrel moving through the neighbor's trees towards my yard. I snatched up my camera as he jumped into my tree and kept moving across my yard. This is one of the resulting phtotos I captured of the squirrel in it's mad dash through the trees. This is the entry photo, to see the full sized version (1024x768), click the photo. So while your here, click through and check out the rest of the entries. Some really great photos entered so far. Great picture...love the contrast of dark branches and white snow. 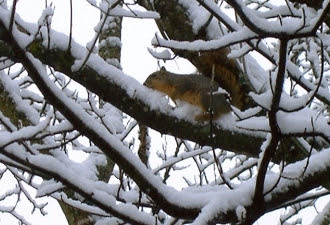 Interesting photo with the contrast in colour of the squirrel and the white snow. Good luck with the competition. poor cold squirrel. Good luck with the contest.